Welcome to Coleman’s Farm Shop. Our New Farm Shop with our own dedicated Butchers and Bakers will be different to anything already in place in Northern Ireland and will showcase local produce from local producers who are doing something unique and brilliant to ensure you have a reason to visit our Farm Shop time and time again. Our Farm Shop will be managed by our Farm Shop Manger, David Thompson and will bring to the local community in Templepatrick and beyond new artisan products with a twist as well as the traditional products you have come to expect. Old fashioned butchery skills , experience and knowledge in our new Farm Shop butchers will come from Jim Irvine and his team who bring a collective 40 years experience and will ensure high quality local meats are matched with the best value, variety and customer experience. We are convinced that you will build a healthy relationship with Jim and his team and they will help you answer that often asked question of ‘What’s For Dinner ? ‘ in many households throughout Templepatrick and beyond. Simply ask Jim and his team as they are here to help and will be delighted to advise you. Click here to find out more. In our Farm Shop it’s about great products done well but also about creativity, flair and relationship building. That’s what we know you want within our Farm Shop and we are committed to deliver – you want expertise and advice from someone you can rely on to deliver a wide range of everyday essentials such as homemade pies, lasagnes, burgers, bacon , traditional and specialty sausages and something just that little bit different that you cannot find somewhere else nearby. 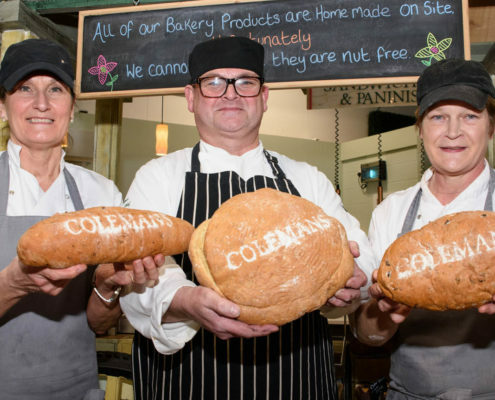 Coleman’s Farm Shop will be a great place to get great bread, meats and so much more and you will find yourself spoilt for choice. Please make sure you introduce yourself to David and Jim as we want to ensure that your experience and our product offering is the best it can be …we want and need your feedback to make the Farm Shop the success we know it will be. We look forward to welcoming you soon to the new Farm Shop at Coleman’s Garden Centre.